An innovative colour-change system for packs of assorted extruded cereals and snacks has been developed by Baker Perkins. The ‘Spectrum’ technique extends Baker Perkins’ extrusion capability and cuts production costs. It enables changeover between colour variations of an extruded product to be made ‘on the run’ with minimal waste. A typical application in the cereals sector is mixed fruit colours in a single packet; in the snacks arena, it could typically be matching the colour of vegetable-flavoured snacks such as carrot, beetroot, tomato, broccoli or peas in a single pack. 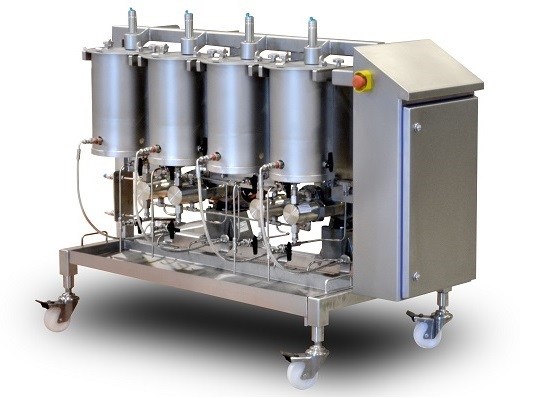 This skid-based system spells an end to the inconvenience and cost of cumbersome mixing and storage of different coloured snacks or cereals, with its adverse impact on waste, hygiene and shelf life. These problems led to a demand for a high-speed colour change system that would allow each colour to be produced in short bursts. The necessary blending of different coloured products can then be accomplished in-line, eliminating the need for off-line storage. Conventionally, colours are injected into the extruder barrel to ensure good mixing but this results in very slow transitions when the colour is changed, leading to considerable waste before a correctly coloured new product emerges. Introducing the colour at the die should avoid this but differential flow rates between the centre and outer again leads to prolonged transitions. Innovative design by Baker Perkins has minimized this differential, and the transition from one colour to the next is now very swift. Baker Perkins extrusion systems make an extensive range of snacks and ready-to-eat cereals, from standard direct expanded to high specification added-value products. Modular lines can be expanded at any time to allow a product portfolio to grow.